About The Trek Stok Kangri is one of the most beautiful peaks in Ladakh and requires no technical expertise or mountaineering skills. This is one of the easiest expeditions in the entire world which gives you a real opportunity to climb a 6150 m mountain in less than a week’s time. The summit presents one of the most spectacular views of the Saser peak in the Karakoram Range, where the K2 lies. The best option to get to Leh is via air. To reach there via road is in itself a trek, as it takes many days and drains out your energy. All major airlines provide flight services from Indira Gandhi International Airport, New Delhi to Leh. Flights to Leh are scheduled to reach before noon or latest by 3pm. While you enter Ladakh, do not forget to look down to one of the most astonishing views of the landscape. The breathtakingly stunning view from the aircraft window is just the beginning; there are many surprises left in the box. The huge Himalayan mountains are taller than any other mountain ranges on the planet. With deep valleys and gorges, Ladakh has all the bounties and miracles of nature. When you land at the Ladakh airport, the sudden drop in temperature will take you by surprise and send a chill running down your spine. The average temperature in Leh stays around the 10 degree C mark, and during winters it can drop down to a bone chilling -20 degrees C or even lower. The air has a distinct freshness and crispiness in it and you will feel like breathing pure air. The chill in the air provides slight indication about the temperatures during the trek to Stok Kangri. Take a stroll through the Leh market, there are various shops selling many different kind of stuff. Few of them will even have things that are required for the trek, thus making last minute shopping a good idea in Leh. The night will be spent in a warm and guest house located in the main city of Leh. Here, you can meet your fellow trekkers, the guide and support staff. People in Leh mostly eat vegetarian food, so it is difficult to get non vegetarian food in the area. Dinner provided will be specially rustled to keep you warm and healthy. Go to bed early as next day you will have to be ready for the acclimatization day, necessary for the trek. Stok Kangri is the tallest mountain in the area, and there is no place in Leh, from where it is not visible. There is no ignoring the huge mountain of Stok Kangri, the final destination of the trek. The morning hot tea is served, which does adds a lot of antioxidants to our body, but most importantly gives motivation to wake up. After a healthy breakfast, the day calls for acclimatization to the harsh and extreme temperature and environmental conditions that will prevail for the rest of the trek. Today you can enjoy the natural and cultural beauty of Leh and its surroundings. You can consider this day to get accustomed with the place and its rich culture and heritage. It is vital to have your first acclimatization night after arriving at altitudes of more than 3000 mts, before you venture out to higher altitudes. Altitude sickness is a common illness among trekkers. 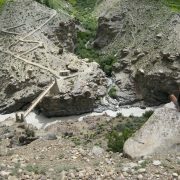 This is so serious that trekkers may have to return without completing the trek. All overnight stays are not planned, and during emergency situations like snowfall, blizzards and snow storms, altitude sickness can happen to anyone. For getting used to such altitudes, start off with a little bit of exercise and stretches, as cold tends to slow down your body movements. Explore the city on foot, enjoy the most beautiful mornings ever, the sun rays feels like heaven on our body. For people in their mid-40s and 50s, carrying an oxygen cylinder is a good idea. Go for a visit to Alchi, which is lower than Leh, this will help you to know the terrain better. There are around 10 monasteries and few ancient temples that you can visit. The Leh marketplace is a good place to spend the day, with shops and stalls open to serve you. Most of them serve a few local dishes which will keep you warm. Today is the actual start of the trek. Deciding to trek in Leh is for many like a dream come true, an experience which is highly valued and rare. Only a slight percentage of the trekkers is actually able to accomplish these treks and people who do are one of the most adventurous. Trekking in this part of the country requires strength and serious courage. After breakfast, your guide will give you briefing on the activities ahead. The trekking starts with a drive to Stok village through a paved road. Before you start, always recheck that you have all the required stuff and supplies for the trek. As the drive starts from Leh, you will come across many beautiful and exotic scenes. The drive to the Stok Village is quite adventurous and has bounties of nature never before experienced. Full of lush green, silver birch trees and colourful flowers, there is no better ride. The weather is perfect during summers and roaming around is very peaceful. Stok Village is situated to the south of Leh and is well known for its royal palace and the King of Ladakh who resides here. If time permits do visit the grand palace and the museum attached to it. The museum hosts many religious and historic artefacts, which depict the history of Ladakh and its ancient rulers. Stok Kangri is not a camping site, but the place where you start your walk to Chang Ma. As it is just beginning, the trek might be a bit difficult to start off. 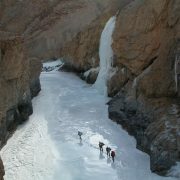 Experience the immense joy of trekking on snow and open up huge possibilities, for moving ahead. After a trek of around 4 hours, the destination for the day arrives. Chang Ma is a popular spot for camping, a firm open ground where tents can easily be placed. You will spend the night here, have your dinner quickly and go for an early sleep; the next day awaits many surprises. Today the trek is to Mankorma, at an altitude of 14200 ft. The day’s trek will involve some climb. 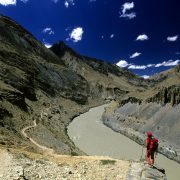 The walk will traverse through the rough and barren landscape of Ladakh. The landscape is astonishingly beautiful, and the huge mountains add glory to it. It is crucial to maintain a healthy rhythm between your trek mates. There will not be any trees on the trek. But this is the actual beauty of Ladakh; grey barren lands make Ladakh the highest cold desert on the planet. The winds are quite strong and gusty and might even sway you from side to side. Do look forward to seeing valleys and vast barren lands. You will have to pass many small streams, and putting your legs into the icy cold water is thrilling. The days trek is fairly easy, and Mankorma will arrive in little more than 3 hours. There might be instances where you might feel symptoms of altitude sickness. Talk to your trek leader frankly and express your concerns. All our trek leaders are Certified Wilderness First Aid Responder and they will decide what’s best for you. You will enjoy the overnight stay in camps. Day 05 will take you to the Stok Kangri Base Camp. At an altitude of 5000m the base camp will be the starting point for the summit. The base campsite is a place where you can enjoy to the fullest. It takes roughly 5 hours to reach the campsite, and the trek is beautiful in its own way. The area has many water bodies around it, and when the sun rays fall on it, they sparkle like diamonds. The air becomes considerably thinner as you climb. When you reach the base camp you have to try hard to breathe. The temperature here is considerably less than the other places in the trek. After having lunch and an hour of rest, go to the nearby mountain peaks of Gulap Kangri, Parcha Kangri and many others. This is surely going to make your day and prepare you for the final expedition. Take some rest in the base camp, to assure that everyone is ready for the extreme days ahead. Having fun is always necessary for any trek; one game that can be played everywhere is cards. Enjoy a few intense games of cards to refresh your mind and team up with fellow trekkers. In the coming days, you will find a drastic change in the climatic conditions and even lack of oxygen is going to affect. For the final climb, adjust your equipments and trekking gear. As the evening falls, your sleeping bags will start calling you. After having dinner, go to bed early, as the day ahead is saved for training. The day will be easy for trekkers. Today is specially meant to know the place and the route to the summit in detail. You can enjoy your time by visiting nearby areas and knowing the place to a much better extent. But don’t take this rest day to sit inside your camp and take naps. 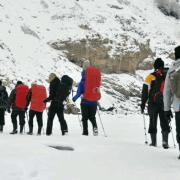 It is very crucial to know all aspects of team work and the techniques involved in climbing a peak filled with snow. Your trek leader and guide will train you for the upcoming climb and tell you about all the challenges and possibilities involved. You need to have enough knowledge about the terrain, depth of snow and other environmental aspects before you start climbing Stok Kangri. The most exciting as well as terrifying part is when your legs will sink into the snow, the snow being very soft and fresh, won’t be able to take your weight. Snow trekking boots are an absolute necessity as it is slippery on the outside and lets you plough through the snow with ease. Know the surroundings very well and the weather forecast for the next few days. Your guide will brief you about the trek plan for the next few days, remember it clearly. At the end of the training period, you will have enough time to take proper rest so that you are prepared for the next day. The upcoming excursion will surely be highly challenging, but will provide immense joy and self-confidence when you make it to the top. The overnight stay as usual will be in camps, but the difference this time is the camps being kneeled onto the snowy ground. Before sleep, you should be in a situation, to take on the summit with a big heart and might. By now, you should be quite familiar with the conditions prevailing during the day and as well as the drastic weather changes during the night. The big day has arrived, to reach to the summit. At the base camp there will be many trekking groups, you can talk to them about their journey to top; it gives an immense boost to confidence. The group will be extremely excited about it, and there will be a buzz around the campsite. Waking up early is crucial for determining the start time, so make sure that everyone in your group is ready as early as possible. 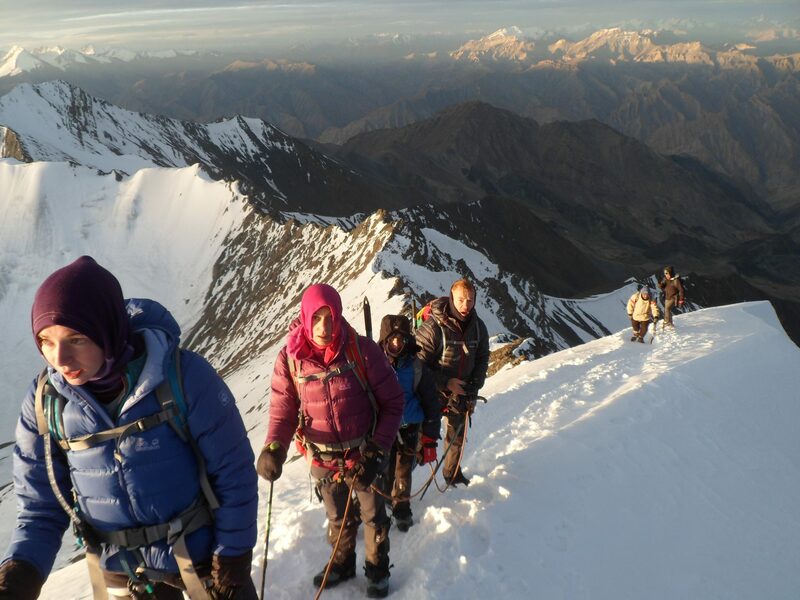 The route goes through glaciers, then through a gradual period of ascent and descent and finally comes to the steep slope to the Stok Kangri ridge. Avoid drinking too much of water and take a light breakfast; this is because during the climb venturing out for answer nature’s calls can be potentially dangerous. The route will start off with a steep and quite tall ascent, and then the slope will change gradually till the time you reach the glacier. The first couple of hours will be tough and extremely demanding. Team members should stay close by and a certain rhythm should be maintained. Encouragement from the guide and other fellow members is of immense help. Techniques such as setting up small targets or checkpoints on the way will motivate you to reach faster. After 3 hours of trekking, you will finally reach the glacier. Take some rest at this point and don’t forget to take pictures. The scene around is wonderful and feels as if you are in nature’s lap. The glacier is the point where the actual climb to the summit ridge starts. Slow climbers may take some more time to reach this point, don’t worry if you can’t see them. Keep motivating your fellow trekkers and team mates, the stretch will take 2 to 3 hours to complete depending upon the speed. To walk safely on the thick snow, use your crampons to get a firm grip and avoid slipping. One excellent way is to fix each and every teammate with a rope; this ensures that even if the situation worsens, everyone is secured. On the way to the ridge, you will have a feeling of self-motivation, and this will help you overcome all the difficulties. After a slow and tiring climb, you will finally touch the ridge. Stand up and see how it feels to watch the world from such a height. Don’t confuse the ridge with the summit; do realize that the real ascent only begins after this point. You can actually very well see that the highest point is still a 2 hour climb away, and the only access to it is via the south shoulder. The shoulder is extremely tough and challenging to traverse. It is very steep at almost 75 degrees and is made up of a narrow channel of rocks. Climb on all fours, any mistake can lead to a fatal fall. After an hour of gruelling climb and tussling with the rocks, the shoulder will ease its way to a much more gradual slope where you can easily walk. Now you can see the summit and the prayer flags that it clearly. The extremely thin air and lack of oxygen will make every step difficult. After a short hike up, you will finally reach the Stok Kangri Summit, the highest trek-able summit in the Indian subcontinent. Celebrate as much as you like; take snaps and do pay respects to the prayer flags. The world looks so different from this place; the clouds feel as if they will touch you. The summit offers a great view of the area, the Karakoram Range and the Saser Kangri dominates the north, whereas the Zanskar ranges in the south. The memories captured here are unforgettable. The return to the base camp follows the same route, but you should be extremely cautious and extra careful this time. When you go down, the gravity also pulls you; this might lead to slipping and a fall. After reaching the base camp, take some time to settle down and immerse in the memories. The day ends at a very high note. This is the final day of your fantastic trekking vacation; the unbelievable journey which had all the elements of a high altitude trekking will be over after this day. 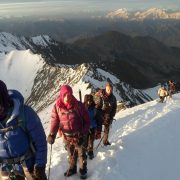 The first hand mountaineering and expedition experience it provides is comparable to none. Today the return to Leh will let you enjoy the snow clad mountains and breathtaking views. Ladakh is known for the black and white beauty with a touch of grey that it provides to its visitors. The joy of trekking can be rejuvenated at this location. The trek back to Leh is exciting and a bit challenging. You will tend to lose balance if you descend very soon, so be careful. Today the walk involved is more than 12 Kms as you need to walk to Stok Village by foot. From there, a drive back to Leh. 5 days continuously on foot will make you nostalgic and devoid of the fun involved with climbs. When you reach Leh, take a hot water bath, it will lessen the pain and tiredness of the trek. The guest house bed will feel very comfortable; that you will never know when you went to sleep. With memories to cherish throughout your life and with happiness from deep within, you leave for Delhi. The Stok Kangri trek has been captured by your footprints suggestion: if you are felling very well you can reduce the trip,I means there is no need any rest .